Protests can turn into meaningful change. Voices when united can wake up people who are standing on the sidelines. And in a democratic society, that change needs to happen in the ballot box. March for Our Lives, currently happening in the streets of Washington, District of Columbia and in hundreds of cities in the Unites States and around the world, is a continuation of the nationwide walkout held by students ten days ago. And this march is not the last step as the movement clearly states, "This fall we will go and vote like no generation has in history. It is only when we show the collective strength of our voices, in the streets and at the voting booth, will they start to listen." 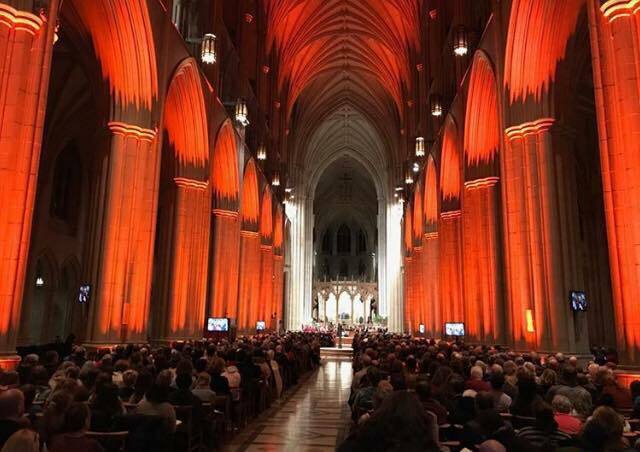 Interfaith Prayer Service (against gun violence) tonight at the National Cathedral. So moving. So sad. So hopeful. I got to hug the mother of Carmen, a 17 year old girl killed in Parkland. She said she’s praying for everyone who marches tomorrow. We were bathed tonight in words, music and sacred scriptures from many faiths, in multiple languages, with teenagers leading the way. So proud that the Episcopal Church has built a cathedral to be a house of prayer for all people. And with regard to the recent walkout of students last March 14, in solidarity with the Parkland students, here are three posts worth noting. The first one is from Andrew J. Rotherham, co-founder and partner at Bellwether Education, a national nonprofit organization working to support educational innovation and improve educational outcomes for low-income students. In the same vein of today’s unsatisfying political choice between right- and left-wing authoritarian impulses, we might ask why we want public schools — which are government agencies — sanctioning protests in the first place. By now, the unpredictable trajectory of American politics should be obvious: At some point, it might not be your favored issue getting the nod. Given that younger Americans are increasingly comfortable with enforced restrictions on speech and expression, anyone concerned with civil liberties should be leery of government agencies anywhere near what smacks of approving content for protests. The picking and choosing of issues should concern us in other ways, too. Would all the colleges offering special dispensation for any discipline that does result from this walkout rush to do the same for students who protest in favor of Second Amendment rights? What if they were walking out for legal weed? That’s an issue many would argue has a moral component, too, given drug laws in this country. It would seem inappropriate to penalize a student for activism, or to treat a suspension for a protest the same as a suspension for an assault, when considering an admissions decision. But vocally blessing and encouraging certain protests in advance? That’s a politically fraught business for colleges. We should want students to advocate for what they believe regardless of what various authorities think — not because of it. Next is from Robert Pondiscio, a senior fellow at the Thomas B. Fordham Institute. Schools that refuse to enforce standard discipline over the Parkland protest may regret it down the road. The vast majority of schools are publicly financed and government-run. If school officials grant students permission to walk out to protest gun violence (a refusal to enforce disciplinary norms is tantamount to official approval), they must also not punish those who disrupt learning to protest in favor of gun rights, or for or against abortion, police violence, or any conceivable political cause. This includes viewpoints many in a school community might deem repellent. Thus, the only sane policy on the Parkland protest is an aggressively neutral stance — with consequences. 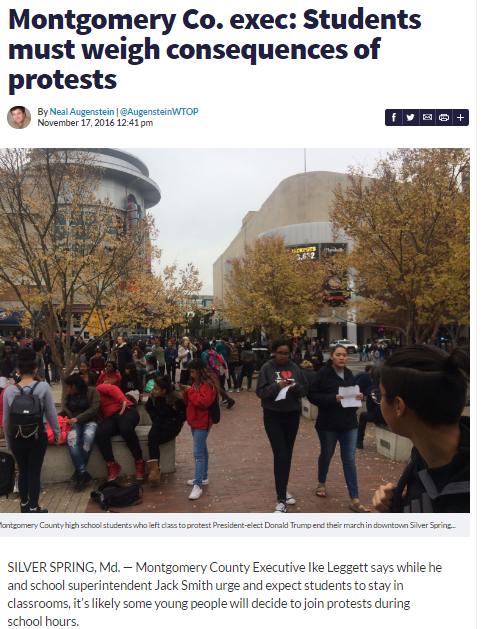 As someone who is deeply concerned about the role of our schools in preparing young people for citizenship, I expect to be cheered by Wednesday’s display of student activism, regardless of whether I agree with its political agenda. But as a civics teacher, my message to students would be that the courage of your convictions carries a price. If your cause is just, you should pay it with honor and dignity. 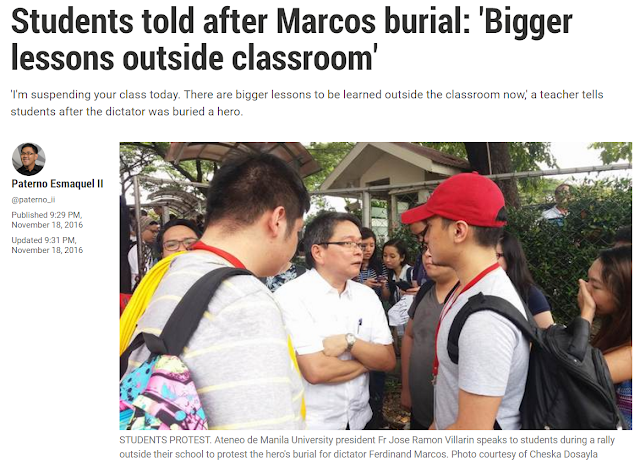 Educators in the Philippines should take note. In the Philippines, administrators and teachers suspend classes to accomodate students' protest actions. There are indeed bigger lessons learned outside the classroom, but it is not about taking the same cause your instructors believe in. It is not about acting without consequences. Worse, these protest actions are often only aimed at destabilizing the government. People in the Philippines have learned the bad habit of going into the streets to remove a president without learning that such only leads to a vacuum in which only worse elements rise into power. There is a difference between the youth making their voices heard on their own and the youth simply parroting. We walk out, we march, we vote - This may just happen with the "Against Gun Violence" movement.